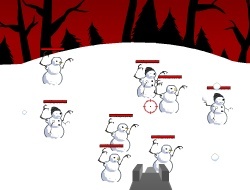 Find an interesting way to play with the snow in this shooting game where your purpose is to defeat the evil that controls those snowmans. You need to handle this critical situation as soon as possible because the snowmageddon is close to begin if you don't react on time. Put your skills on work and try to upgrade your weapons during the game because that is the only way you could deal with the waves of snowmans that are going to conquer the world. Aim and shoot them before they'll reach your base, but be careful because there are many shoots you could execute and the better ones are the headshots. Don't waste your bullets and prepare yourself for a dangerous fight that needs to be your victory. Prove your talent and approach different strategy to win this battle, but take care of your life too. Use the mouse to aim and shoot and space change your weapons. Snowmageddon 0.00 between 0 and 10 based on 0 votes.